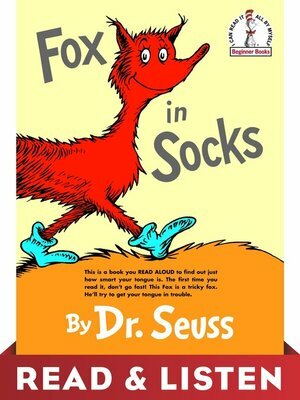 This classic Dr. Seuss Beginner Book features silly tongue twisters that will have readers of all ages giggling with glee. When a fox in socks meets Knox in a box, you know that hilarity will ensue. Add chicks with bricks (and blocks and clocks) and you're sure to get your words twisted and lips locked. With his unmistakable gift for rhyme, Dr. Seuss creates a hysterical and energetic way for beginning readers to dive into the joy of reading. This book comes with the following warning: "This is a book you READ ALOUD to find out just how smart your tongue is. The first time you read it, don't go fast! This Fox is a tricky fox. He'll try to get your tongue in trouble."